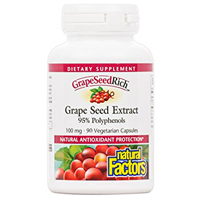 GrapeSeedRich is a “super strength” grape seed extract created by Natural Factors. It is a dietary supplement that contains antioxidants for the purpose of maintaining good health. In addition to antioxidant protection, this product supposedly protects blood capillaries and veins to support healthy circulation, reduces oxidative stress to help prevent mental decline that is age-related, reduces eye strain and enhances night vision, and can provide polyphenols to help neutralize free radicals. This impressive-sounding product contained the following active ingredient when this GrapeSeedRich review was written: GrapeSeedRich Grape Seed Extract 100:1 50 mg.
Research that has been conducted on grape seed extract shows strong evidence that it may be beneficial for several cardiac conditions. It may also help with high cholesterol, may reduce swelling caused by injury, and assist with diabetes-related eye disease. Although many people take grape seed extract because it is believed to be high in antioxidants, which are substances that may help to prevent disease and protect cells from damage, there still isn’t enough evidence to prove that the antioxidant properties of this ingredient is actually beneficial to people. Grape seed extract comes from grapes and no other source. It is considered to be relatively safe to take with the most common side effects reported being headache, dizziness, nausea and itchy scalp. Although most healthy adults should be able to tolerate this dietary supplement, you should not take grape seed extract if you are allergic to grapes. Due to lack of evidence regarding its safety, it is also not recommended for pregnant or breast feeding women or children. If you have a bleeding disorder, high blood pressure or any existing medical condition, talk to your doctor before taking GrapeSeedRich or any other grape seed extract product. It is also important to inform your doctor about any medications you might be taking, as grape seed extract could interact with drugs, including NSAIDs (painkillers like ibuprofen, aspirin, etc. ), blood thinners, heart medications, cancer treatments, and so on. The suggested use for GrapeSeedRich is to take 1 capsule 1 – 2 times daily or as directed by a physician. That being said, the highest safe dose of grape seed extract is unknown. It is also unknown what sort of effects (if any) GrapeSeedRich might produce. That being said, it would be wise to speak with your doctor about taking this product if you intend to make it a regular part of your lifestyle.